The WH&LA Merit Scholarship offers up to $2,000 to be applied toward education. View the online application form and apply here. The Greater Madison Hotel and Lodging Association Cal Worrell Scholarship offers $1,000 to be applied toward education. View the online application form and apply here. Applications must be received by May 1. Please contact Monica at service@wisconsinlodging.org with any questions. 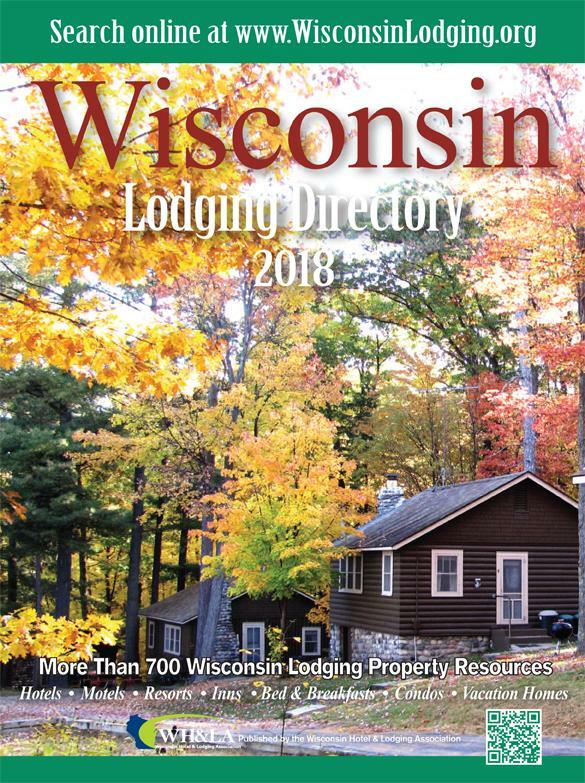 Showcase the excitement and beauty that Wisconsin lodging has to offer as the featured property on the cover of the 2019 Wisconsin Lodging Directory! Gain exposure across the Midwest and beyond when your property graces the cover of this annual directory. The Wisconsin Lodging Directory Cover Contest allows properties to submit photos for judging, and compete in an online quest for the most votes from a group of 12 finalist photos. Engage your Twitter followers, Facebook fans, newsletter subscribers and loyal guests to help get out the vote! Wednesday, April 4 @ 11:59 pm CDT. WH&LA lodging member properties may submit up to two photos featuring indoor or outdoor locations at their Wisconsin lodging property. No identifying signage is allowed. Web-resolution photos may be submitted for judging, but a high-resolution, print-quality version must be available. No exceptions. Photos must be e-mailed to Michelle in the WH&LA office by WEDNESDAY, APRIL 4 at 11:59 PM CDT. Photos received after the deadline will not be considered. Hard-copy photos may be mailed to the WH&LA office if digital copies are not available: Lodging Directory Cover Contest, 1025 S. Moorland Road, Ste. 200, Brookfield, WI 53005 and must be received by the deadline. All photo entries will be submitted to a third-party for first-round judging, where 12 Cover Finalists will be chosen with no more than one finalist image from any one property. Each of the 12 member properties chosen as a Cover Finalists will be charged a $300 promotion fee for the added visibility outlined below. The past three years of cover contest winners (2018, 2017 and 2016 pictured above) are not eligible to participate in the 2019 contest. No additional fees will be charged to the Cover Contest winner. 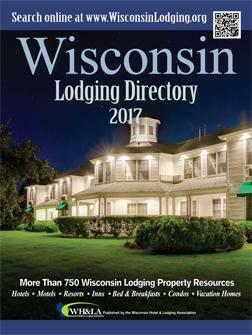 The 12 Cover Finalists will each have a 2019 Lodging Directory cover designed and displayed at WisconsinLodging.org/covercontest from Friday, April 6 through Thursday, May 3. The traveling public will be able to vote for their favorite cover on the page. Each finalist will also be featured in a special edition of the WisconsINN Getaways email newsletter in April, sent to more than 8,000 subscribers. Additionally, finalists will be promoted via WH&LA’s Facebook and Twitter accounts throughout the voting period, and finalists are encouraged to promote the contest through their own social media channels. The winner of the cover contest will be announced on Friday, May 11. By submitting photos to the Cover Contest, you are agreeing to pay the $300 promotional fee if you are selected as a finalist. WH&LA member property Cover Finalists will be notified and billed the $300 promotional fee on or around April 9, 2018. If payment is not received by May 3, 2018, the property’s image will be disqualified. The Cover Finalist that is chosen as winner must renew its WH&LA membership on or before June 30, 2018 (or on or before the date of membership-year expiration), to be eligible to be featured on the cover. The winner must also continue or expand its Lodging Directory advertising commitment from 2018. If a property wins the cover contest but chooses not to renew membership, it will be disqualified and the second-place finalist will be named the winner. WH&LA reserves the right to refuse any photo submission for any reason. Questions? Contact Michelle in the WH&LA office via email at communication@wisconsinlodging.org or call 262/782-2851. Thanks to the generous donations of our members, we are pleased to announce that our “Enjoy Wisconsin” Online Auction is now open for bidding and will run until noon on Tuesday, March 20. The proceeds from the auction subsidize the costs of our many services, to keep dues and fees as low as possible. View all of the great auction items available and place your bids here! We appreciate everyone helping to make our online auction a success by donating items, bidding on items and spreading the news about the auction to your co-workers, friends and relatives! We are so pleased to welcome WH&LA’s newest members! The Victorian Dreams B&B, Holiday Inn Express, and M3 Insurance all joined in February. Visit their websites to learn more about these new members.